The research programme Semantics and Syntax: A Legacy of Alan Turing, held at the Isaac Newton Institute for the Mathematical Sciences in Cambridge, UK, 9 January to 6 July 2012, was one of the central activities of the Alan Turing Year 2012, the world-wide celebration of the life and work of the exceptional scientist Alan Mathison Turing (1912-1954). It had almost 200 visiting fellows and programme participants, as well as several hundred additional workshop participants, and was organised by Arnold Beckmann (Swansea), S. Barry Cooper (Leeds), Benedikt Löwe (Amsterdam & Hamburg), Elvira Mayordomo (Zaragoza), and Nigel Smart (Bristol). 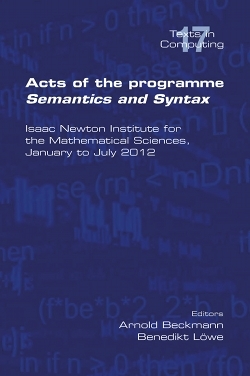 This volume documents the presentations that were given as part of the programme, which include the abstracts of the teaser talks given in the Seminar at the Isaac Newton Institute, and abstracts of the talks given at five of the seven workshops, as well as written versions of two open problem sessions.